USING HANDMADE TOOLS AND LUXURIOUS FIBERS, A SYDNEY CRAFTSMAN PAINSTAKINGLY WEAVES A DESIGNER’S PALETTE OF TASSELS AND TRIMMINGS. Beyond a doorway swagged with rope and giant tassels is a timeless world of manual looms and simple, ancient looking tools. A series of wooden boxes packed with antique linen yarn, form the steps to studio level, where Morrison Polkinghorne, sydney-based extarodinaire of tassels and trims, practices his art. Under a loom sits ‘Cilla’, his Tibetan terrier, whose silky coat is rather like the clutch of tassels that are piled on a nearby workbench. Despite the accomplishment of his work, it was during a Christmas visit to France in 1990, that Polkinghorne realised his vocation. “I sensed there was something around the corner,” he says. “I was looking at fabric shops when it suddenly struck me. This is it. This is what I want to do. I want to make tassels. Undeterred by the fact that he had no real notion of how to make a tassel or weave a braid, he returned to Sydney fired with ideas for his debut collection. And so Passementeries, the collective term for trimmings of braids, cords, beads and the like, became his newly found passion – and his company name. It is hard to believe, looking at the immaculate detail of every strand of his work, that Polkinghorne is entirely self-taught. “I have always made things. As a kid I used to pull apart cassette radios and reassemble them. L learnt from my mistakes – when something fell apart, I’d look at why. 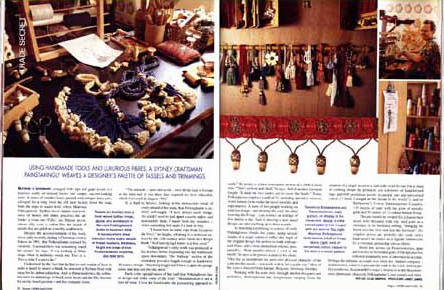 Such is the specialisation of his craft that Polkinghorne has to design and make many of the tools and looms. “Mechanisation is not a love of mine. I love the hand-made, the painstaking approach to work.” He points to a three-centimetre section of a $600 a meter trim: “That’s an hour and a half'” he says. And of another six-meter length: “It took me two weeks just to cover the beads.” Today, Polkinghorne employs a staff of 12, including specialist weavers, wood turners (who make the tassel moulds) and rope-makers. A team of two people working on a bullion fringe – can produce an average of seven meters a day. And developing a new tassel design can take anything up to three months. In matching a trimming to a piece of cloth, Polkinghorne blends his yarns, using several shades of a single colour to reflect the depth of the original design. he prefers to work with natural fibres: silks, linen, mercerised cottons, jutes, metallics. “Real metallic thread is cold to the touch,” he says as he presses a skein to his cheek. One has to incorporate the particular physical character of the yarn into the tassels – you work with it, let it guide you.” most of the yarn is sourced from Europe: Belgium, Germany, Sweden and France. Working with the trade only, through interior designers and architects, Polkinghorne has assignments ranging from the creation of a single tassel to a full-scale retail fit-out. For a chain of clothing shops, he produced one kilometre of hand twisted rope and 600 pendulums tassels in natural jute and mercerised cotton (:I think I bought all the thread in the world!”); and for Melbourne’s Crown entertainment Complex, 110 meters of rope with a diamater of 12cm, and 80 meters of 12-colour bullion fringe at 45 centermetre height. The jute tassles he created for Queensland resort were threaded with tiny seed pods as a reference to its bushland setting, “bringing the forest over the river and into the furniture”. His simplest pieces are probably the small turk’s head tassel he makes as a regular commission for a blind company producing canvas blinds. From tiny acorns at Passementeries, spun and knotted in burnished gold, Polkinghorne has nurtured an industry, now of international acclaim. Perhaps the ultimate was when his “mentor company”, Scalamandré, asked to represent some of his work in the USA. And in perfect symbiosis, Scalamandré’s range is displayed in the Passementeries showroom alongside Polkinghorne’s own tassels and trims.